Courses in chemistry have been taught at NC State since it opened in 1889 as the North Carolina College of Agriculture and Mechanical Arts (A&M). During the tenure of George Tayloe Winston (1899-1908) as university head, the curriculum in applied science was changed to chemical engineering. In 1899, a program for chemical engineering was introduced. In 1920, Winston Hall was completed to house chemical, civil and electrical engineering. The first three B.S. degrees in Chemical Engineering were awarded in 1920. Dr. Kenneth O. Beatty and Frances Richardson measuring velocity with radioactive tracers, 1952. In September 1924, the Department of Chemical Engineering was formed by Dr. E. E. Randolph, reflecting the increasing importance of chemical research in North Carolina. The department awarded its first B.S. degrees in 1924 and its first M.S. degrees three years later. Throughout the 1930s and 1940s, the department continued to grow, and in 1948 the Engineer’s Council for Professional Development (ECPD) gave the department a two-year provisional accreditation. Full accreditation was awarded two years later. The department began the 1950s by moving from Winston Hall to Riddick Hall. In 1954, James K. Ferrell received NC State’s first Ph.D. in Chemical Engineering, and growth continued apace throughout the remainder of the twentieth century. On September 16, 2004, the department inaugurated a new era as the officially renamed Department of Chemical and Biomolecular Engineering. This was followed by the opening of Engineering Building I in January 2005 on NC State’s Centennial Campus. A program for chemical engineering was introduced in 1899. The first B.S. Chemical Engineering degrees were awarded to Frederick Vernon Harcourt Smith and Kenneth MacKenzie Urquart on June 9, 1925. The department awarded its first M.S. degree to James Whitney Perry on June 5, 1928. The department received its first accreditation from the Engineering Council for Professional Development (ECPD) for the 1948-49 academic year. 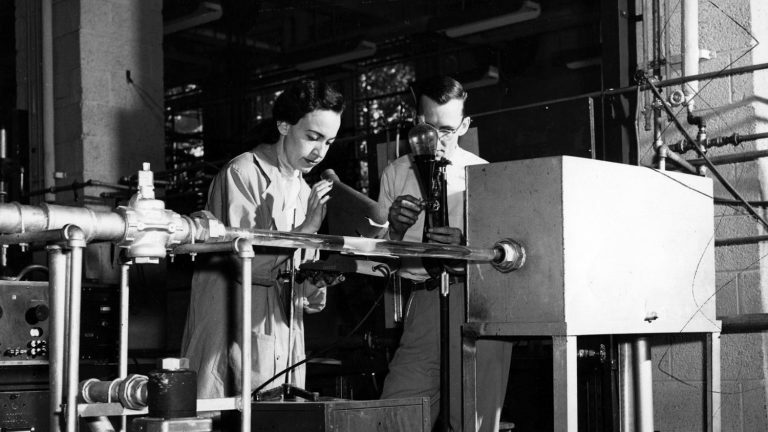 Lois Madden (Lohneiss) Todd (’48) was the first woman to graduate with a degree in chemical engineering; she was also the third woman to receive an engineering degree from NC State. The department, with nine faculty members, moved to Riddick Laboratories during the summer and fall of 1950. The department’s first Ph.D. was awarded to James K. Ferrell on June 6, 1954. Average starting salary for the B.S. recipients in 1970 was $901 per month. Hubert Winston (’75) was the first African American to receive a doctoral degree in chemical engineering; he also holds the distinction of being the first African-American faculty member in the department and in the College of Engineering. Christine Grant became the first African-American woman faculty member in the department and the College of Engineering in 1989. The Department moved to Engineering Building I on Centennial Campus in 2005.